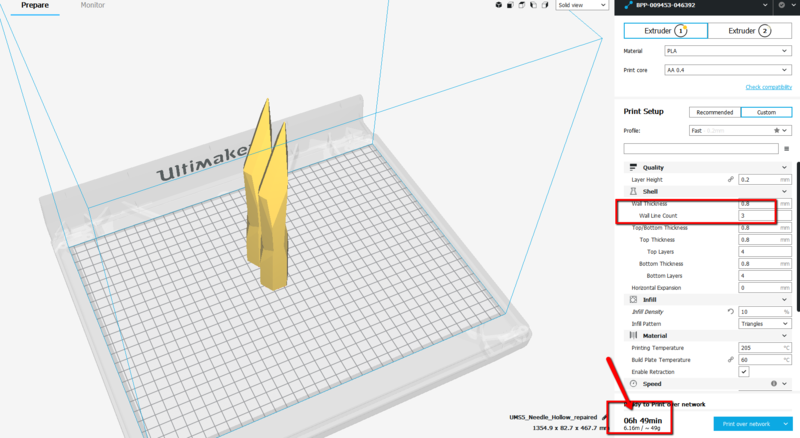 Cura: I think you're doing math wrong. I have an Ultimaker S5 with a .4mm nozzle. I was recently in a rush to finish my 3D Prints before a con(what's new hahaha) and I figured I would just drop my Wall Line Count down from the Default 3 to 2. I happened to look at the print time, and I noticed the time increased by a hour when dropping the wall count down. Surely that could be right. What I think might be happening is that the wall thickness and nozzle width setting is calculated based on the size of the nozzle. The wall thickness IS NOT an exact multiple of the width of the actual nozzle. So when an FDM printer, like my Ultimaker S5, extrude the filament the spacing of the path has to match the nozzle width.